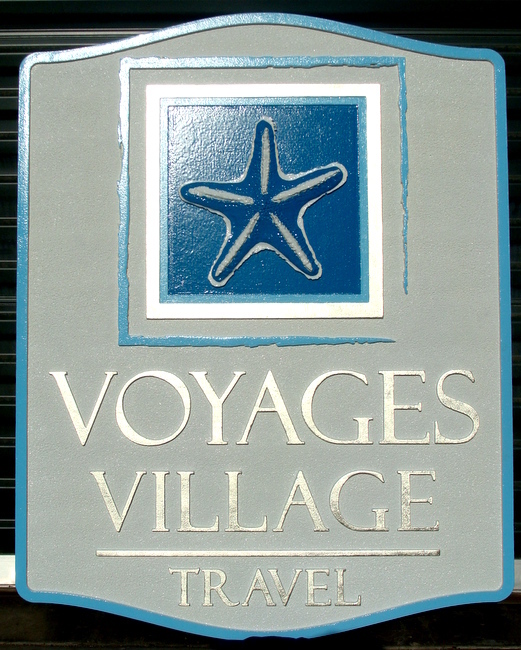 This handsome sign for Voyager Village Travel has text ,border and art (starfish) raised over a smooth background, carved from High-Density-Urethane (HDU). The text is gilded with silver leaf, and the birder and art are painted with bright, long-lasting 1-Shot sign enamels. The sign is then clear-coated twice. This sign can be placed either outdoors or indoors. It can be hung from a scroll bracket or wood beam over a sidewalk, or mounted on a wall or placed in a window.